A hallmark of the Sinhala and Tamil New Year is the tradition of renewal, both spiritual and otherwise. From painting one’s house and celebrating a good harvest, to taking part in ‘Ganu Denu’, which marks the first financial transaction of the new season, these symbols of renewal are cornerstones of Sri Lanka’s heritage and culture. NDB Wealth encourages you to embark on a new Avurudu tradition, where you plan for your family’s financial security by investing for the long-term. Planning ahead empowers you to stop living from paycheck-to-paycheck, doing away with the constant fear of not having enough savings to meet your daily needs. In many situations, when you plan ahead, you also plan smarter. As a result, no matter what you face, you are prepared for any eventuality, which leads to much better control and growth for your investments. Combine the mindset of smart planning with NDB Wealth’s unmatched plans and expert advice, and you can truly elevate your financial planning to enjoy an unparalleled degree of financial independence. For those that are new to investing, NDB Wealth offers a range of money market funds, which are the ideal platform for beginners who are unsure of where to start. Unlike regular savings accounts that offer minimal returns, or fixed deposits that tie up your savings for long periods, money market funds from NDB Wealth offer an attractive income as well as enhanced flexibility by offering withdrawal of money anytime as well as income being tax-free and reflected in the price on a daily basis. “Planning ahead and planning smart is the only sure way to ensure a secure financial future for you and your family. 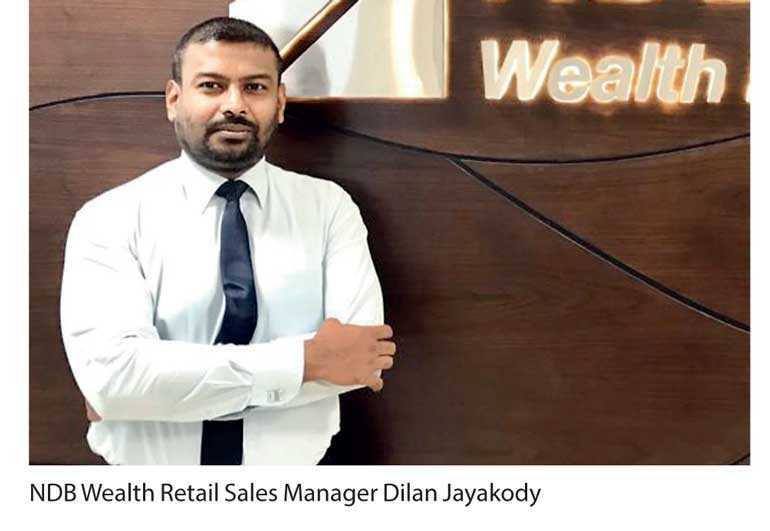 This Sinhala and Tamil New Year, invest in NDB Wealth’s Money Market Funds, or even any other innovative financial products we offer, to ensure that you will accrue wealth instead of living day-to-day only, making sure your money works even harder for you,” NDB Wealth Retail Sales Manager Dilan Jayakody said. So, this Sinhala and Tamil New Year, it’s time to take control of your financial future, to get the most out of life. NDB Wealth’s team of expert financial planners is on standby to advise you anytime so that you can achieve complete financial stability with all the advantages that come with it.